I meant to post this yesterday in honor of the 10 year anniversary of the day we adopted Sam and Emma but I ran out of energy in the early evening. Sam is responding well to the new food with extra fiber, he hasn’t had diarrhea in about four days and his stools have improved as he’s transitioned to the new food. His appetite has been good but there is still room for improvement, and we’ll see how he does overall when he’s been on the new food over time. I had a dream a couple of weeks ago that consisted, in its entirety, of me scooping litter boxes and judging Sam’s poop, so I’m looking forward to when this twice daily activity becomes routine again and the little fellow is feeling better. If he looks gaunt in this picture, he wasn’t, he’s just sunken down between my legs. He’s curled up on my lap at the moment with Trixie just coming in to snuggle up next to her hero. 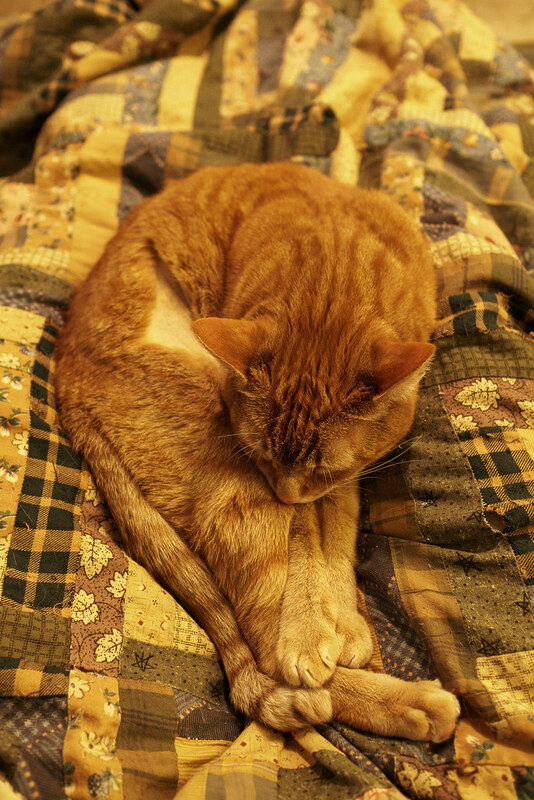 This entry was posted in Pets and tagged cat, orange tabby, Sam, sleeping, snuggling. Bookmark the permalink.